Today, I went to our guild's last UFO day until the fall. 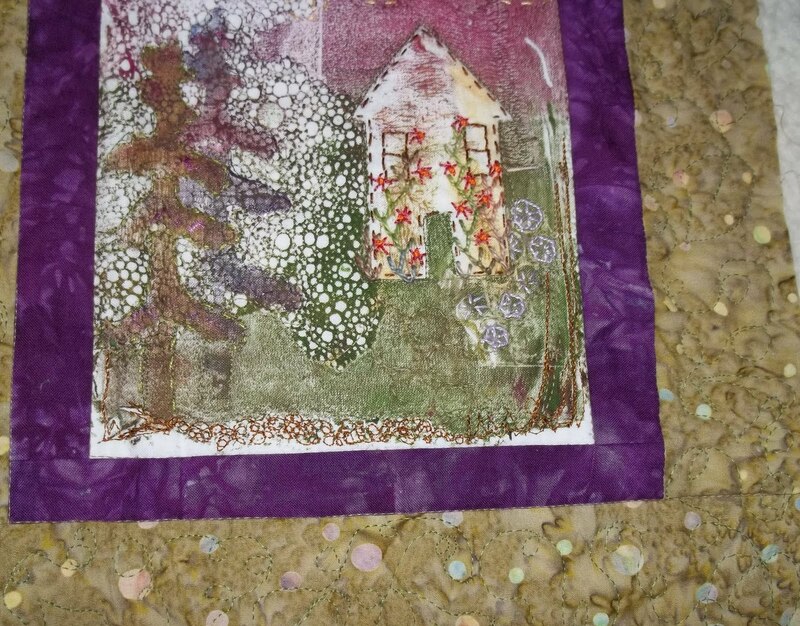 I took my little Jem gold and worked on the free motion quilting on my mystic woods wall hanging. My plan (and you know what happens to those) is to finish all the machine work this week, and then I can drag it around all summer camping and visiting friends to do the hand embellishing. 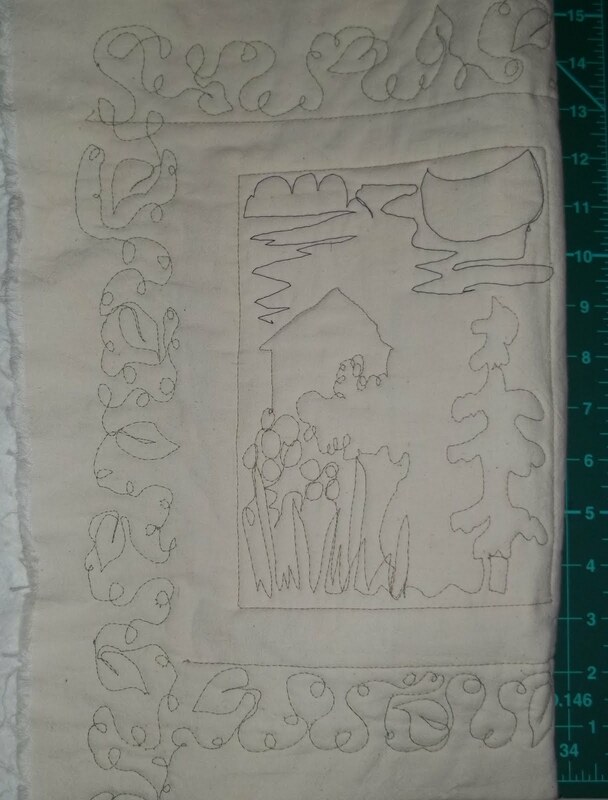 I also drew up a plan for a future quilt. Yes, I have a design wall of blocks to put together and a baby quilt I want to do first but one must be prepared. Now that I have a better idea of the fabrics I'll need, I placed an order for some greens, turquoises and orange/pinks from Pink Chalk Fabrics. These are some of what I have now. As I was placing the order I turned and noticed these goldfinches on the little feed sock in my window. I love their squeaky peep. 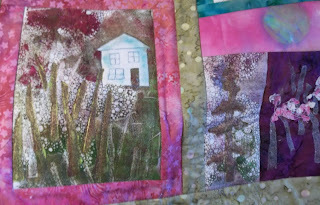 When I sew, they are right in front of me and when it's warm enough to have the window open, it'll be even livelier. 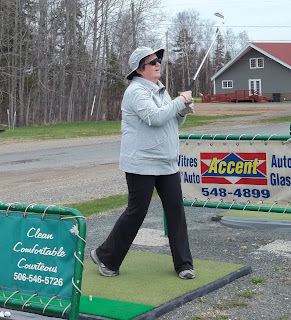 Our plan tomorrow was to go golfing but the weather is sure not cooperating. The rain and cloudy days are unrelenting! 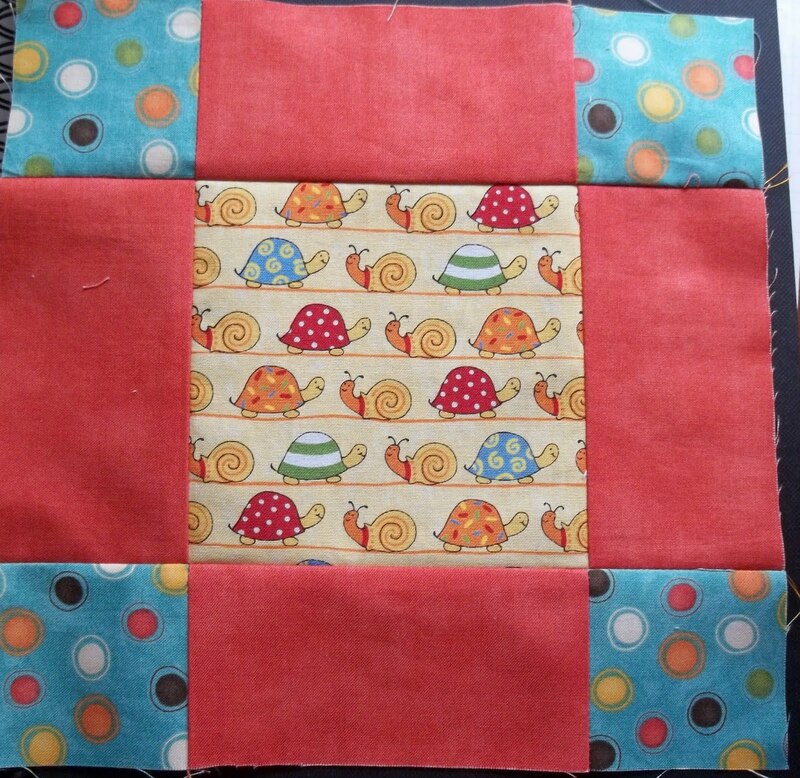 A least i can sew. It gets a bit depressing though, and you don't feel like doing anything. 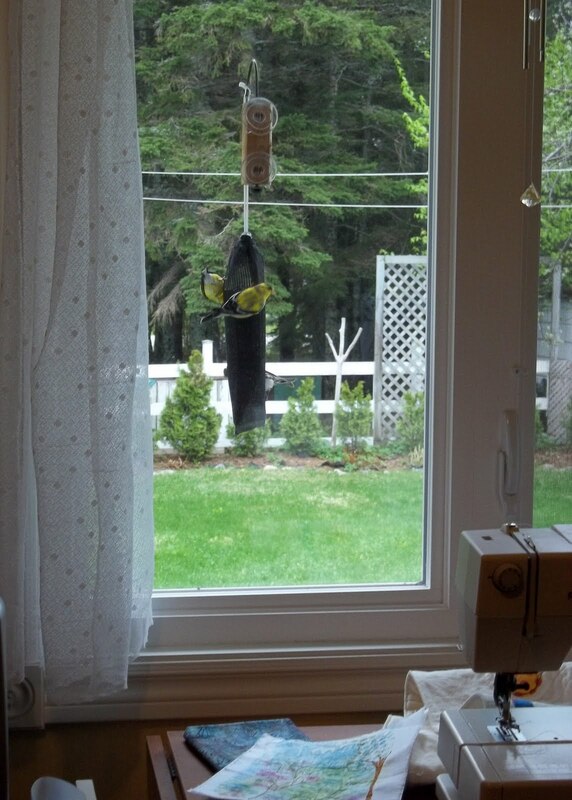 For the last 2 days I've been able to sit out on my swing, watching and listening to the birds. after supper and chores are done, Gord and I can sit there for an hour leisurely swinging back and forth with nothing to do but feel the breeze, listen to the the rustle of the leaves and the songs of the birds. We like to watch the antics of all the birds especially in the bird bath. 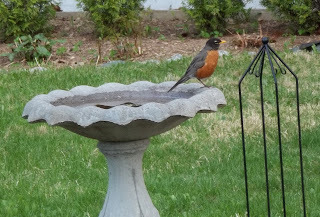 The sparrows and the gold finches sneak in when the robins back is turned but he will inevitably turn and chase them away. 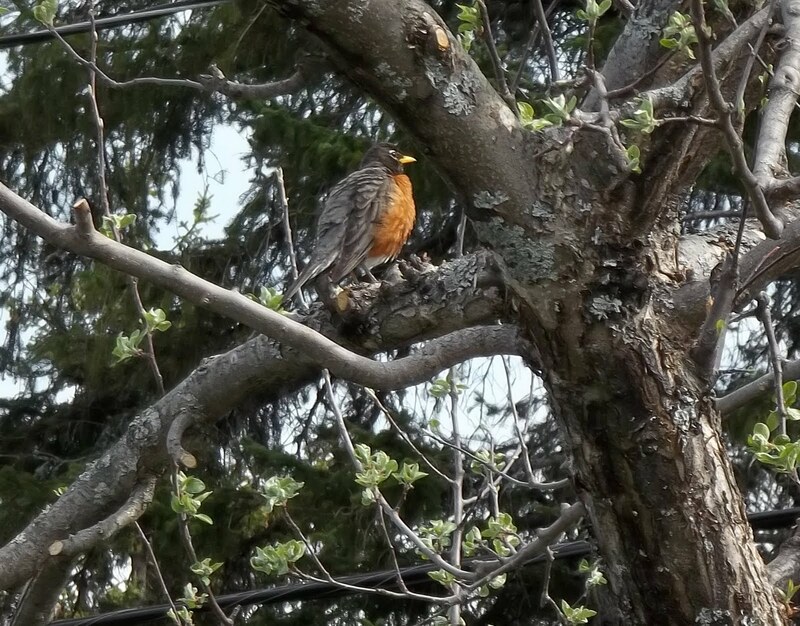 This robin took a leisurely bath and then fluffed out in the apple tree. Today is my lunch day with friends, but before I go I will put a coat of the special epoxy paint on my bath tub which i spent yesterday prepping. I wear a mask and will leave the house for the day. It was a lovely almost cloudless Wednesday yesterday. I had my usual Wednesday morning swim at the spa which was really nice with the blue sky and sun shine shining into the pool. There are windows on 2 sides so it makes it much more cheery when the weather is good. 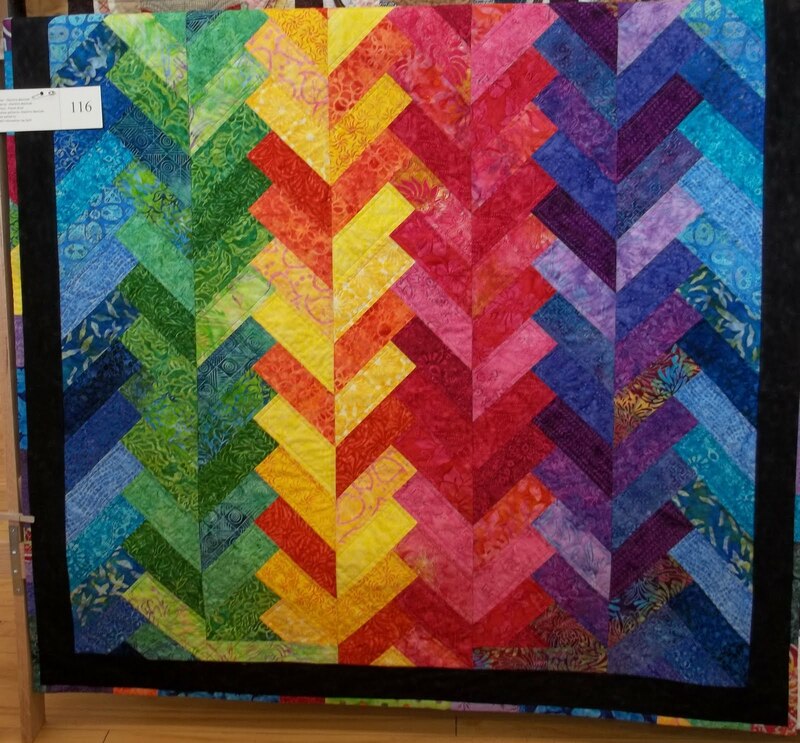 After my lunch I laid this quilt top out on my table and carefully spray basted it by rolling each section back. I also added a few basting pins. 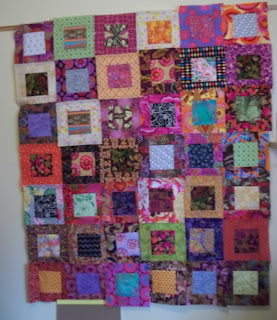 I wanted it to be ready to take to a retreat in a couple of weeks. It'll be a nice project to work on in the company of friends. This package of Kona cotton fat quarters came in my mail today. I plan to use some in a baby quilt. Then I was able to sit on the deck on my swing with my tea and my book for a good rest. Summer is coming! Today, though, it's forecasting rain, so I've gotten my walk in early this morning. I'm going to meet friends for coffee now and this afternoon I'm going to start prepping my bath tub to paint it. I did it about 15 years ago with excellent results. We just cannot afford to rip all the tile apart in order to change the tub. I'll let you know how it goes. For the last couple of years Gord and I have kept it simple on our anniversary, as we did today. He went to hit golf balls this morning while I met friends for coffee. After our lunch we went for a drive along the coast. We made a stop for a coffee and a tea along the way to a wharf where I like to sketch my favorite old fish huts. Gord is always happy to wander or take a snooze in the car seat as he did today. It was most relaxing. On our way home we stopped at my friend Nicole's so I could pick out a basket from her most recent shipment form Africa. 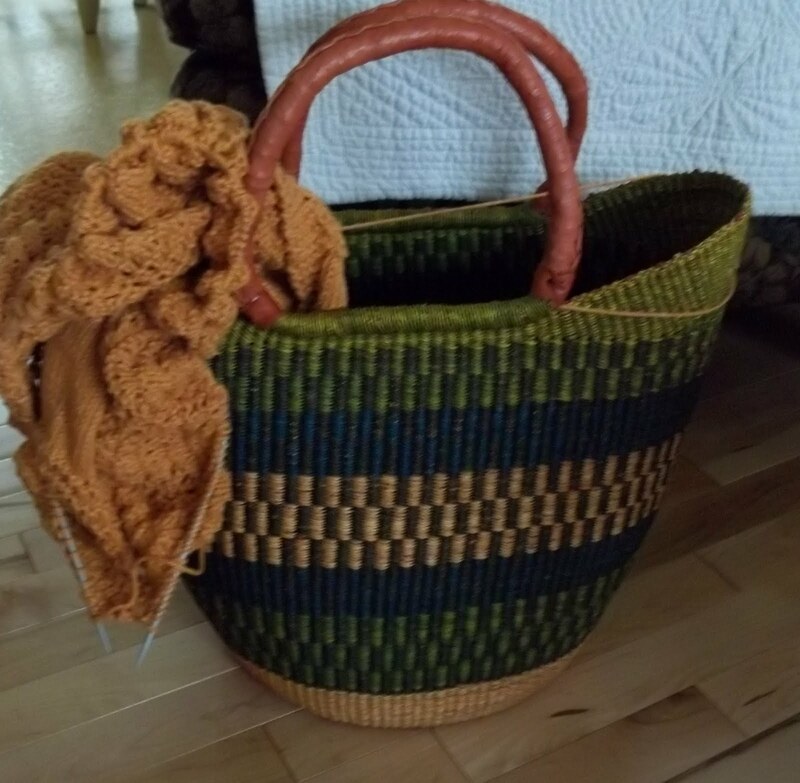 I'm using it for my knitting for now. The colors are perfect in my living room. I couldn't have asked for a better day! We seem to find our happiness in the simplest things. We had one day of sunshine and heat last week and then for a couple of days we've been plunged back into the gray cold again. Today, though the sun finally came out around noon. It warmed up some but was still pretty chilly. 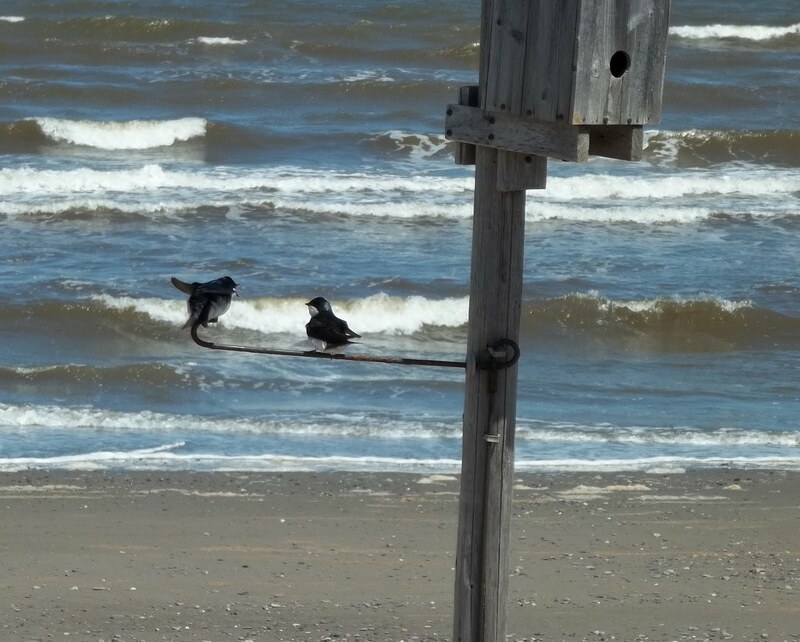 We sat in the sun room at the front of my in laws place at the beach and watched the swallows dipping and diving and frolicking around. I managed to catch them in one of their few still moments, but I was unable to capture the beautiful iridescent blue when the sun hits their backs. 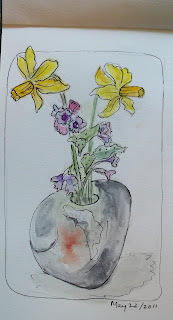 When we came home, I felt so cheered, I picked these few first flowers from my garden and did a quick sketch. 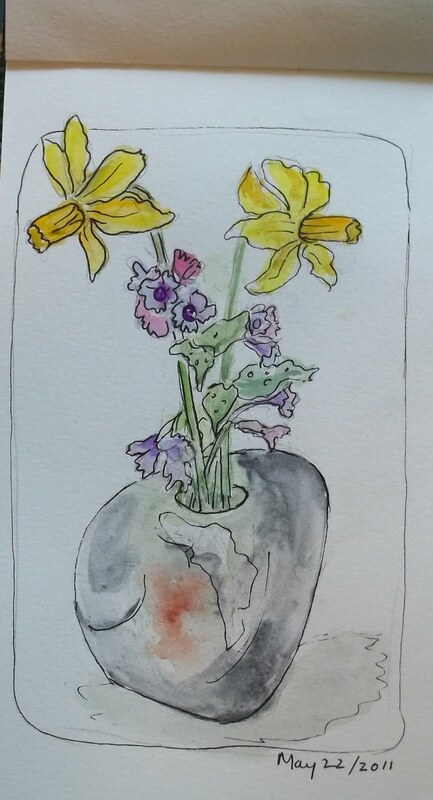 The vase is actually a stone that has a hole bored into it. I like to keep a few sprigs of something in it all summer. Since it is our anniversary tomorrow (31 years), we went downtown to the Nectar for dinner as they're closed tomorrow due to the holiday. Gord had his favorite --the veggie burger. It came with roasted vegetables, salad and sweet pototoe fries which we shared. I had a crab cake with salad and we shared a white cake with fresh fruit and raspberry coulis for dessert. Now I must go get the clothes off the line and head to the tub for a nice soak with my most recent book, the Dome, by Stephen King. Today, we saw the sun for the first time in weeks! There were still a lot of ominous looking clouds around, but at least it didn't rain and it was very warm. Right after my lunch, I got out my bicycle for the first time this year and went for a spin. Then, I spent most of my afternoon outside. I re-potted some of my tomatoes, beets, and borage that I had started. Earlier this week, I finished the last 2 cobblestone blocks. As you see it, I have not yet re-arranged the blocks in their final layout. I can see that the picture is a little blurred. That might actually help me to use it as a reference when I move the blocks around. 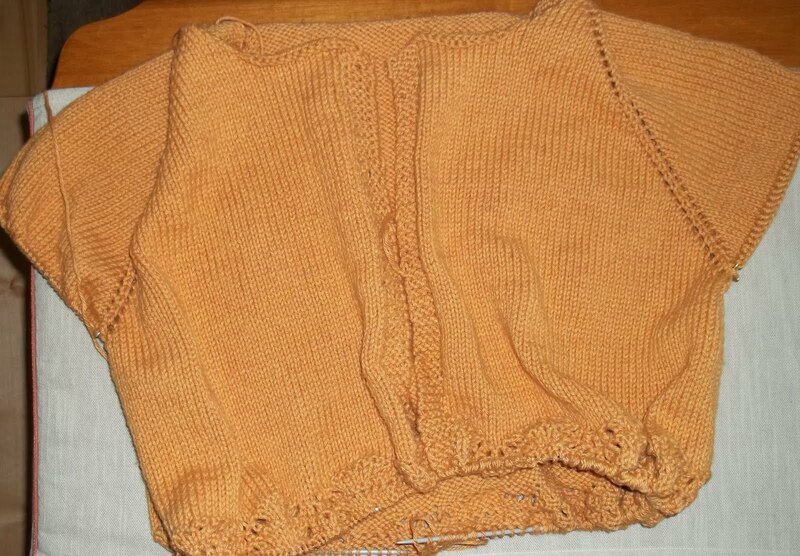 At night and when I need a break in the day time, I'm still knitting away on my gold sweater. I'm happy because I finally got to the wavy pattern on the bottom. It's more fun to knit the easy 4 row repeat lacy pattern than the plain stockinette stitch. We're expecting more rain in the next couple of days; although, it's supposed to clear on Saturday afternoon so there's hope. Sunday and Monday of our long weekend look promising! When I haven't posted in a few days, you can assume I've had some appointments and perhaps some low time, health wise. This past few days it's been a bit of both. Keeping adrenals, thyroid and blood sugars all balanced is not easy, and to complicate it my stomach and my bowels are not working as they should. I'm taking several medications for that as well, none of which seem to be working. I'm sorry to bore you with the details here; if I had the energy I'd write a second blog chronicling my ills, as it would be helpful to have a network. For now thanks for bearing with me. 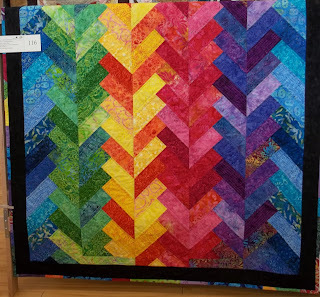 I went to our guild's UFO day yesterday for a couple of hours and got quite a bit of the free motion quilting done on this piece. I did all of the foregrounds with mossy green, so next I will do the sky areas with a pinkish color. Then it will be ready for the hand embellishing which I will work on all summer, hopefully finishing in time for the fall show in Saint John. I've been keeping my goal to do a zentangle every day or two. Here is the latest. I would like to pick some elements that I like in the end and translate them into an fiber art piece. The other thing I worked on today besides baking muffins and resting is this little sandcastle. I started with an acrylic paint mono print which I did a couple of weeks ago and I've added pastel. Next, i will spray fix it and apply it to a board. 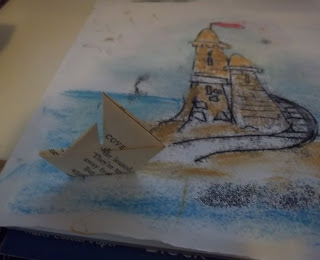 If all works out as planned, I will add some collaged paper boats. This is for a collaborative project that I'm doing with my sister. I passed up my morning exercise to talk to my daughter via Skype. It's one of those things you just have to do! Then I had to go out. I spent lunch at my friend, Susan's, along with Glenda , Donna and Paula. It was a surprise that she made soup and scones, and we sat afterwords and looked at quilt patterns, chatted and then knit for a bit. I'm working on a top down sweater. 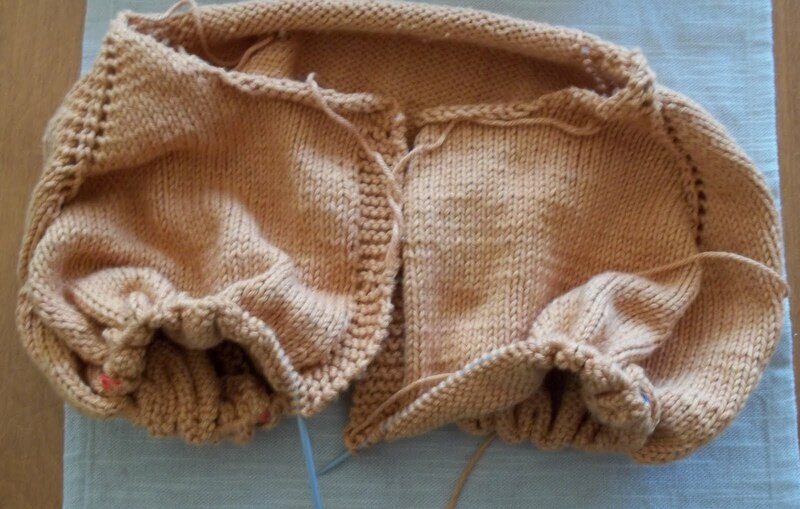 I'll show it again once I get started on the bottom which is a zigzag lacy- like pattern. 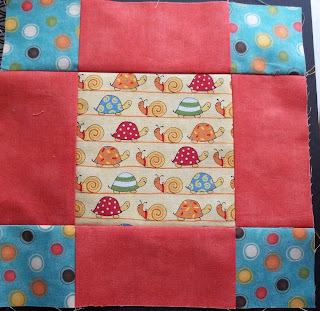 I had pulled a Deb Strain charm pack from my closet the other day and today's chat inspired me to start a baby quilt. It's a good thing to have a couple on hand and they're fun to make. I opted for the block below. I used a print from the collection called Frolic. I don't pay much attention to the names of collections but my friend recognized a few I had and gave me some to go with them. It matches the charm pack perfectly. I always like to do a sample block to see what it's like. I wanted something simple because I don't want to cut up the charm squares; they're all so cute! Also, I had to order some solid colors as the one in the block is all I have. So, I'll have to wait for them. I ordered a fat quarter pack of Kona solids. Yesterday, I finished the quilting and zigzagged the edge on my mill piece. I have to re-coat the canvas and then tack it on. I felt it should have a raw edge as it is industrial, but I'm not sure I like it. 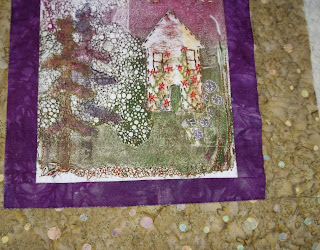 It is going to be tacked with big sewing stitches to the canvas though so maybe it suits. Maybe I'll change my mind and face it. 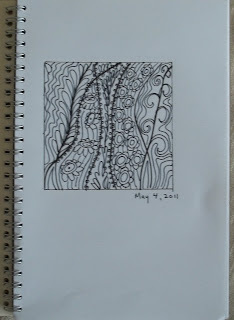 This week I delegated one sketchbook for zentagles. 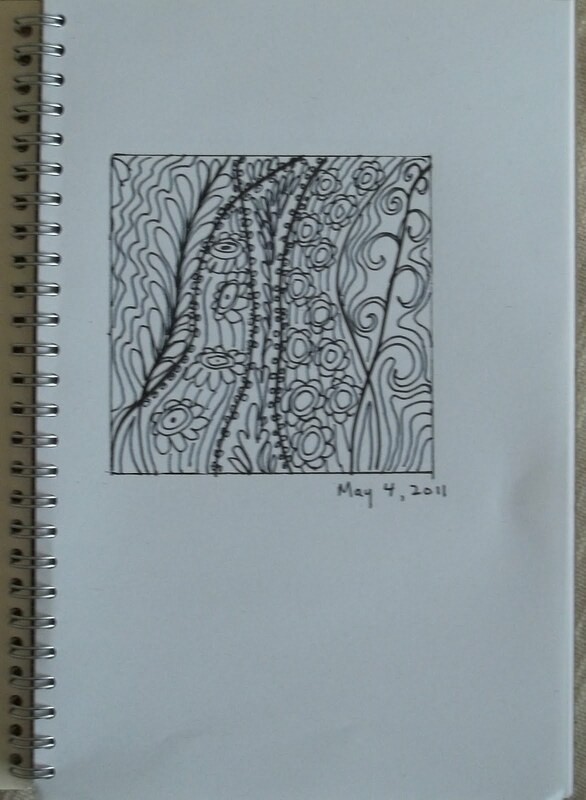 I feel I need to do more doodling. It's surprising relaxing and meditative. I'm writing to say I'm still here; I just haven't done much sewing. In between the rain this week, and we got a lot, I was outside a bit in the yard. It was mostly a rainy week though until the weekend. The rainy weather is not inspiring and I found myself to be very lazy all week. 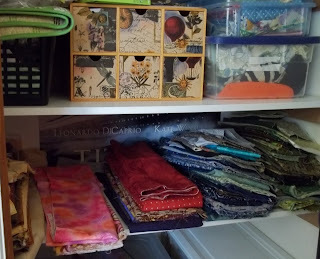 To get myself going, I started to go through my Rubbermaid boxes of fabric from my small closet in my sewing room. 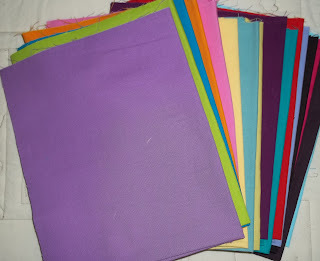 I've decided to stack some of the fabrics by color on the shelves. It takes up less space, is a little lighter in weight, and you can see what you have. 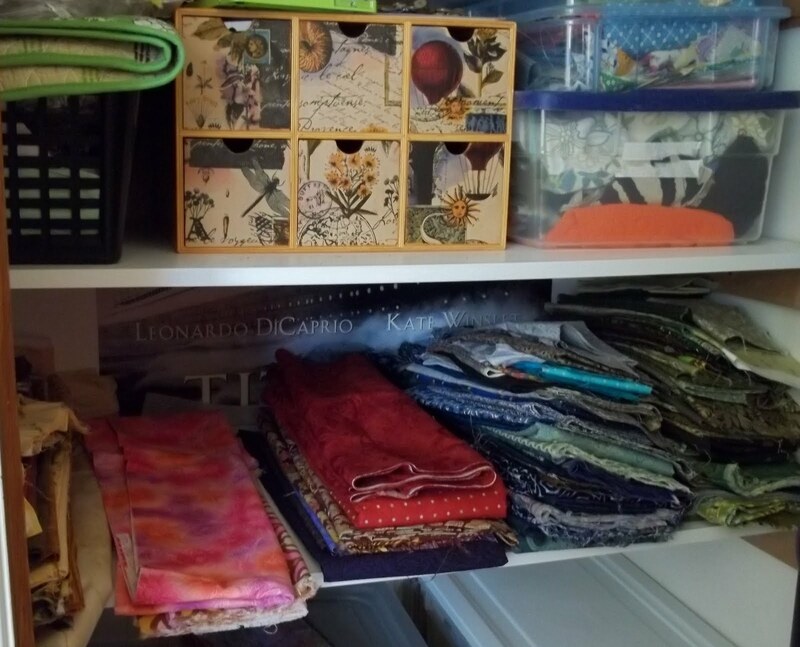 My husband is spending his mother's day afternoon making me another little shelf to fit underneath the one in the picture for more stacks of fabric. 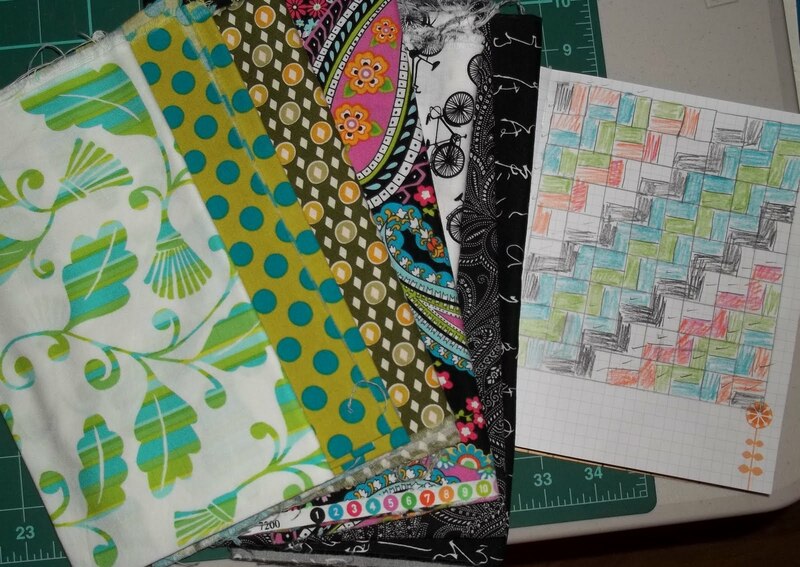 A lot of my fabrics I don't use anymore. It all looks very dark doesn't it? I am going to pull some out and try to sell or give it away in bags sorted by color. 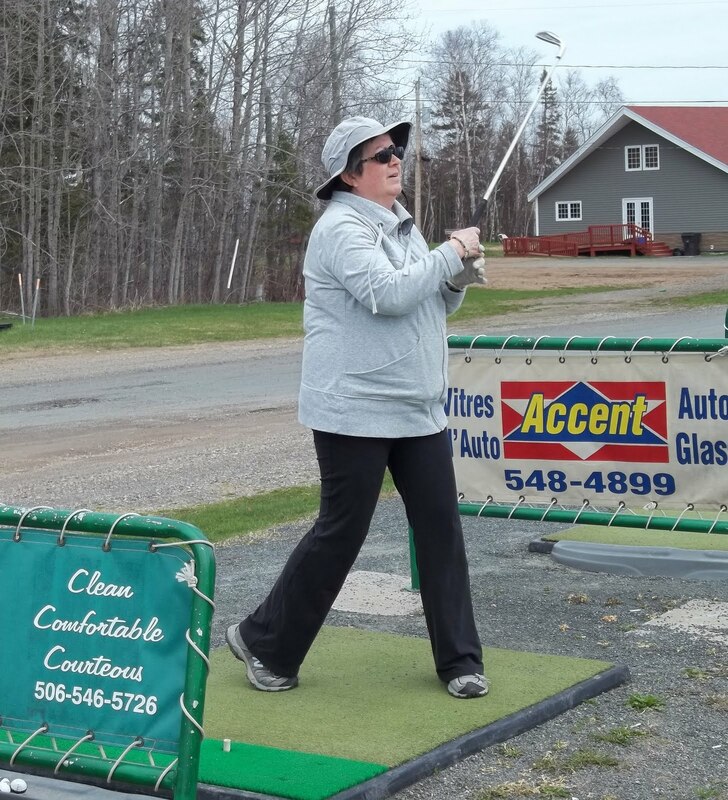 Yesterday, when it looked like it truly wasn't going to rain for a while, Gord was itching to get to the driving range, so we both went for the first time this year. I'm no pro, but I did pretty well and had some nice shots. There's nothing like a photo though, to tell you that you need to lose some weight. This afternoon, I spent a little time outside in my gardens. I knew spinach was an early crop and doesn't like the heat, but I had no idea it would grow this early up here in northern NB. We still have a patch of snow in the backyard. I planted it a couple of weeks ago and it's up. I would have taken a picture just to prove it; however, it's covered in a white mesh to keep out the ground hog. Every year I plant and some little (well actually they're pretty chubby) guy comes to eat the little sprouts. This stuff works though. I took a trip downtown this morning to drop a little birthday gift off to my friend Nicole. I chose a heritage black tomato and a borage plant from my collection that I started from seeds. I read that the borage blossoms, while very pretty, are also edible and would be lovely in a salad. 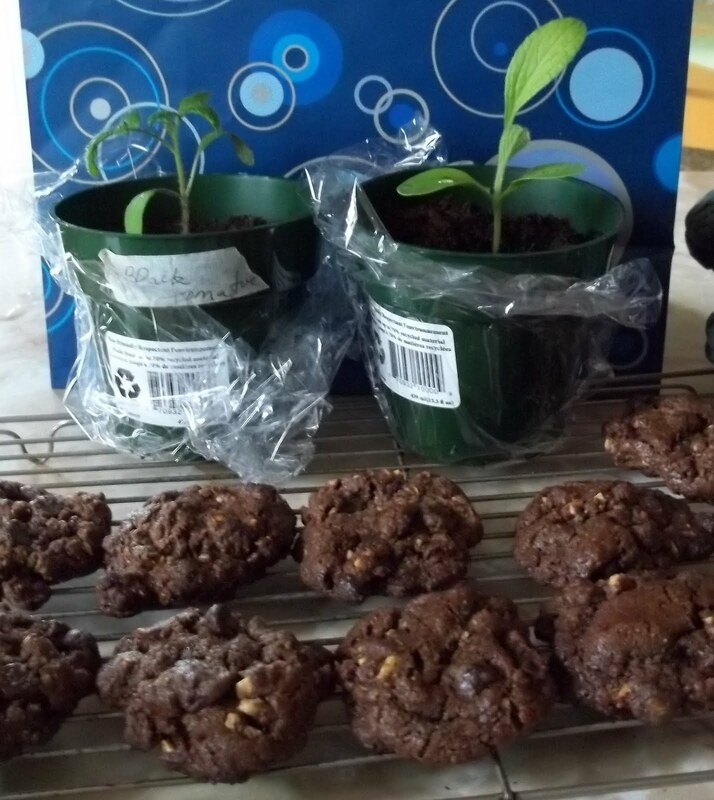 She says she's not a green thumb with house plants but it just has to survive a few weeks until it can go out into their vegetable garden. Oh, included a half dozen double chocolate chip cookies too. Next, I ate a sandwich (along with my cut up veggies) at a local shop called the Book Gallery where I had to pick up a book that I had ordered for my mother in law. 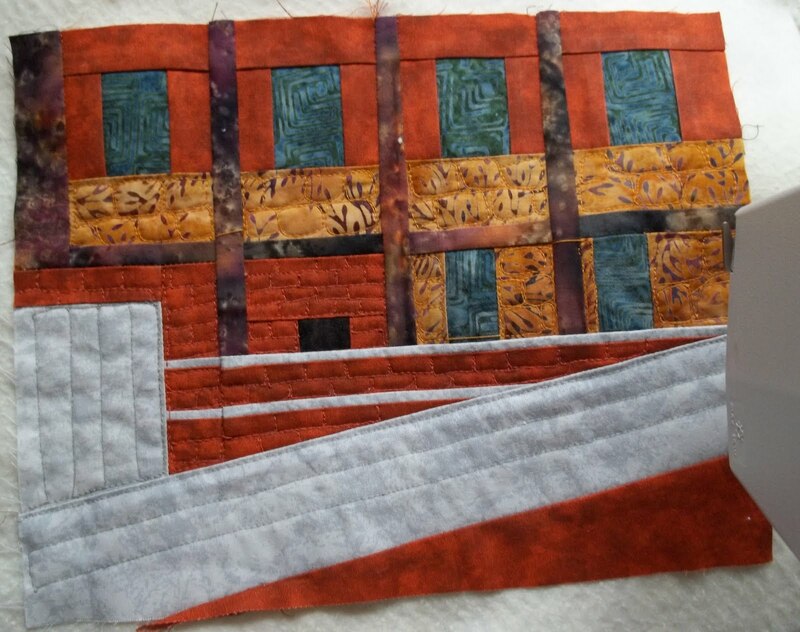 Since I picked off all the paper backing from the 'mill' piece while watching Dancing with the Stars last night, it was ready to be sandwiched and quilted. This afternoon, I got quite a bit done. 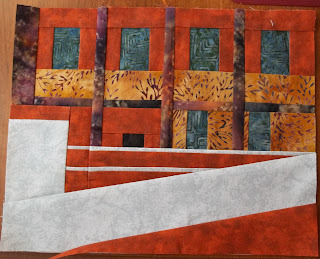 I want lots of texture--bricks and stones and metal-- because it will stand out even more if I decide to layer on some paint. You should just be able to see that there is a little more of the brick work to do. I have a few pictures of quilts from our North Star Quilt Guild show this past Friday and Saturday. The first 2 are done by my friend Charlotte; I think I was attracted by the colors. 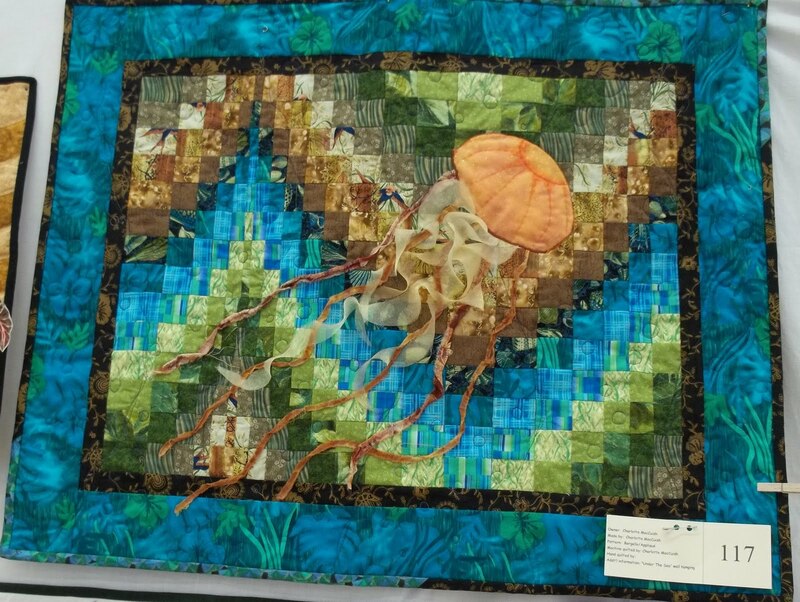 I love the jelly fish that she designed too. 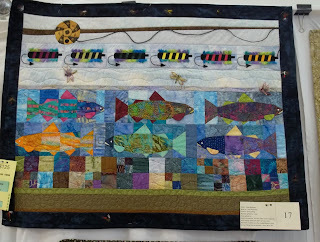 This one with the fish was also done by another friend, Anne, who also loves color. 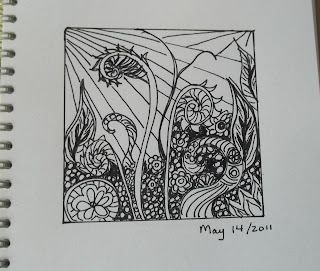 She did use a pattern, but she always adds her little personal touches like the dimensional dragonflies. 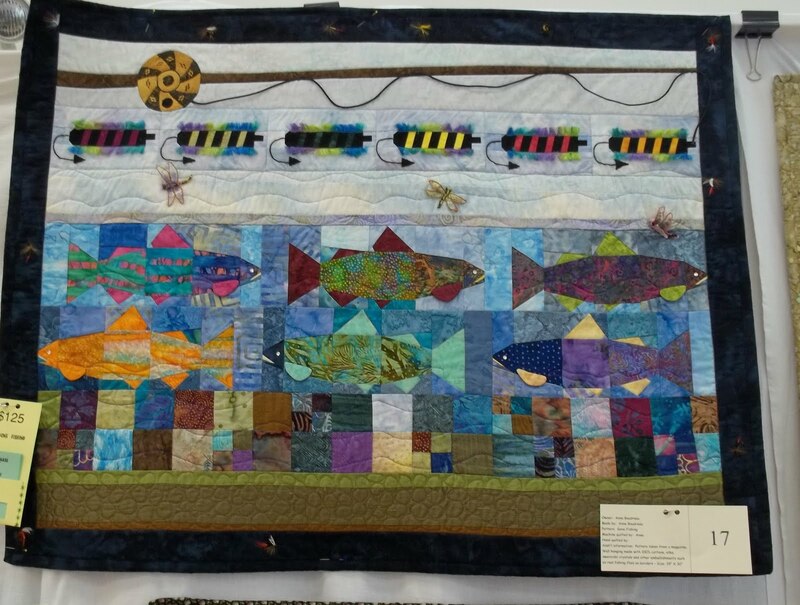 In the fishing flies she used bits of eyelash yarns and at the bottom of the quilt you might notice a piece of silk as the river bottom. 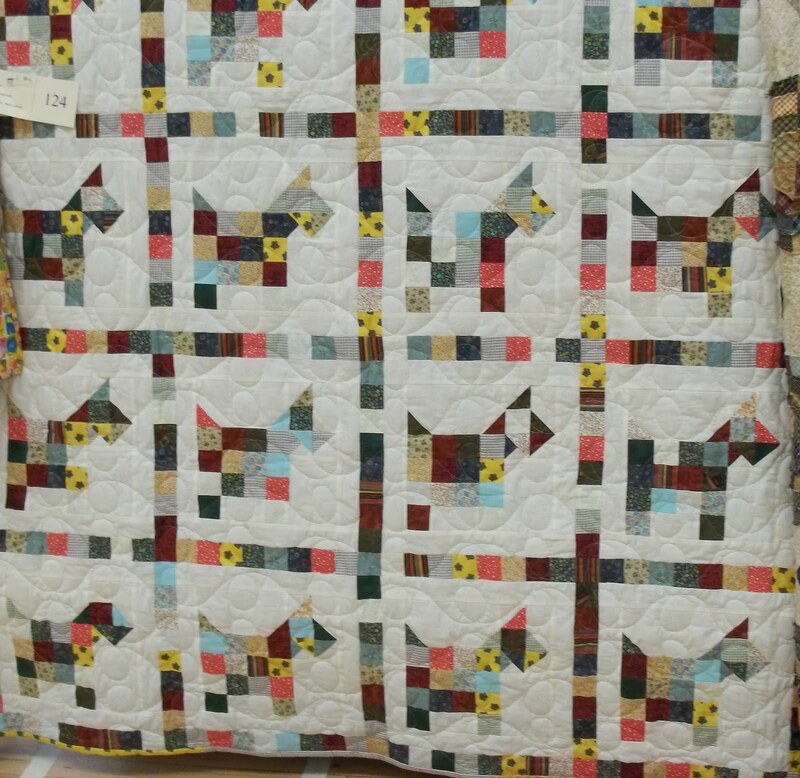 I always love a scrappy quilt and I thought this little Scottie dog was cute. I did not make note of the maker's name. 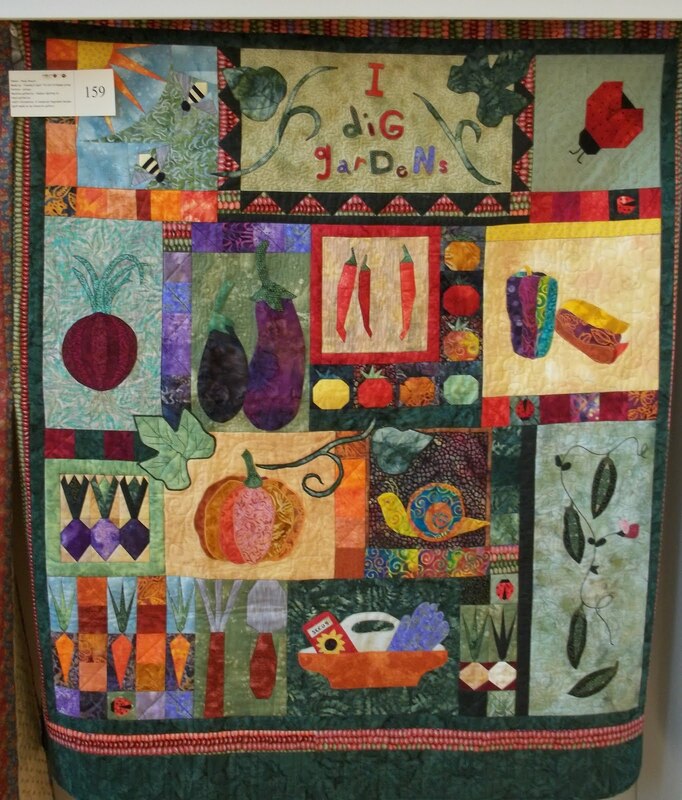 This gardening themed quilt belongs to my friend Paula. 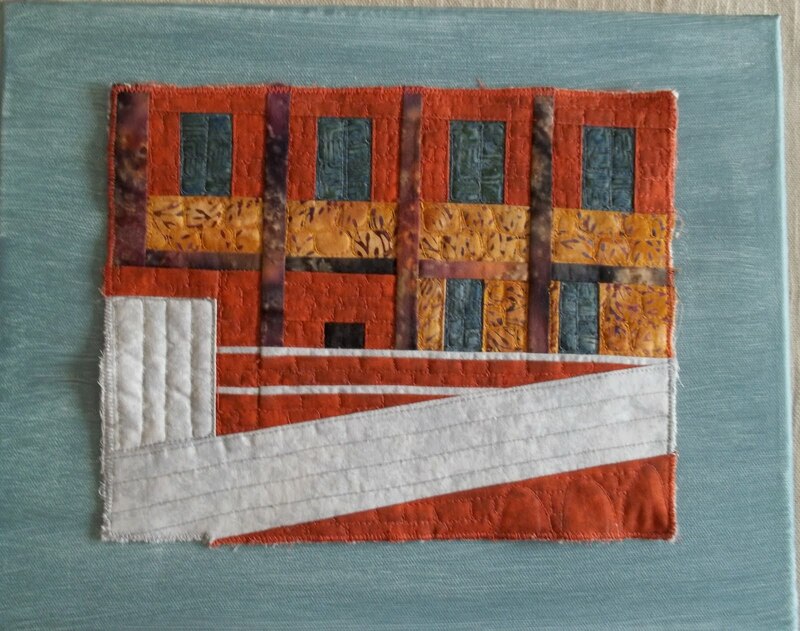 It was a tin can exchange quilt that I participated in with 11 other quilters. We each made a block to fit her chosen theme and colors. I've had a sore throat and head cold for the last few days, so I didn't really help out at the show much. Of course I managed to drag myself in to buy some new fabrics! 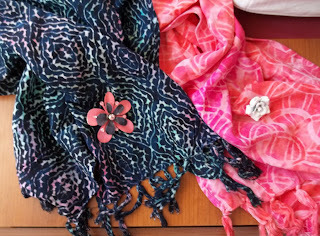 I purchased some variegated thread and more batiks from the Quilting Bee and More from Charlottetown. 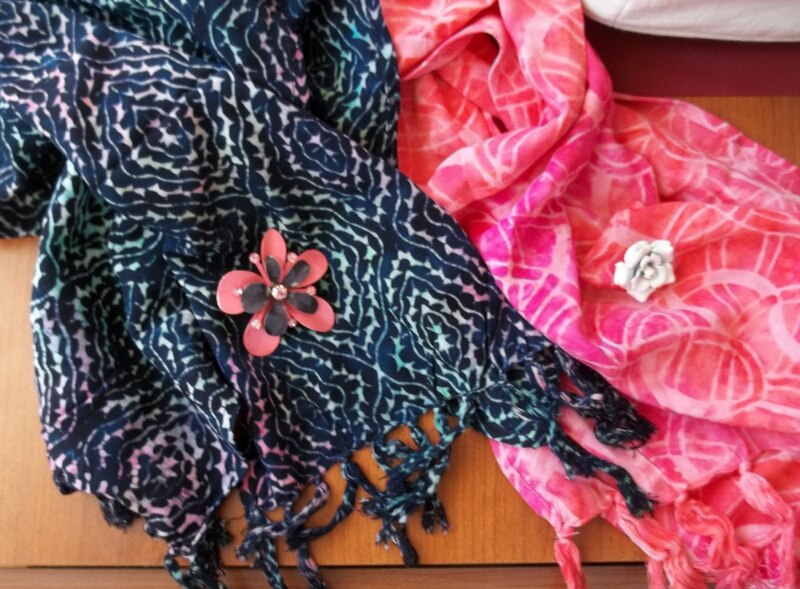 They also had these lovely silk batik scarves which I could not resist. One is for me and one is for a gift. I can't decide which one I can part with. On Friday, I finished paper piecing my close up section of the mill. I am going to sandwich and quilt it next, and I plan to mount it on a larger canvas. 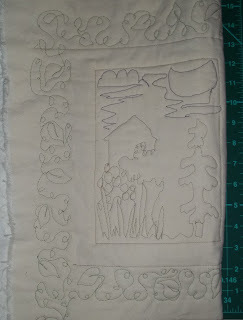 I'm thinking of rolling some paint onto it after it's well quilted to bring out the textures, but I will have to experiment on another piece first and work up the nerve.